The three-star linebacker who has committed to California is playing here his dad Saul was such a good player they retired his number. It’s not often a football coach can replace talented graduated players with a scion of a legend, but that’s Corey Sampson’s fortune this season. 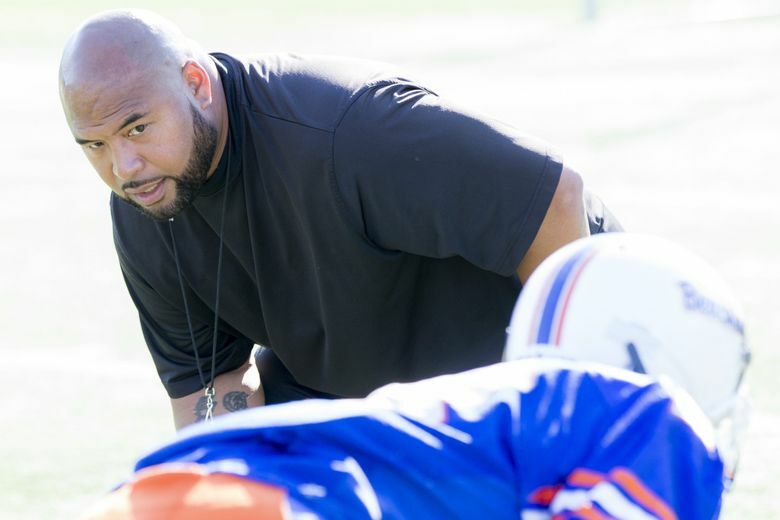 The Rainier Beach coach welcomed Orin Patu to the roster after last year’s star-studded senior class led the program to a historic Class 3A state tournament runner-up finish. Patu likely doesn’t need an introduction since his grandmother Betty is a member of the Seattle School Board, and his father’s No. 33 football jersey was retired and hung in the school’s gym. But Orin wants to display a style of play that ensures spectators never forget his name. The three-star outside linebacker transferred from Oregon, where he played for Sheldon in Eugene. Patu, a 6-foot-4, 200-pound senior, had 34 solo tackles and five sacks for the Irish as a junior, turning an interception into a 57-yard touchdown in the postseason as one of his final acts. Orin’s parents Saul and Alana met in college at Oregon where Saul was a four-year defensive starter who graduated as the third all-time leader in sacks. Alana played softball. After eight years following Saul’s professional career, the family resettled in Eugene. Despite Alana being a native Californian, there was always a longing to move to Seattle. It became official in January as Saniah, who now plays at Saint Martin’s, and Orin played for Beach’s basketball teams. Orin logged two minutes in the Vikings’ state championship loss to Garfield. As many stories as Orin has heard about his father playing at Rainier Beach, the one that stuck is it being a basketball school. Last year was a first time the South-end public school advanced to the title game in boys basketball and football. Beach finished its football season at 9-3 overall and six of the 21 players in the graduating class moved on to play Division I football. The returnees are talented, they just didn’t get the playing time as they were behind the seniors. The Vikings retained the heart of its defense in junior linebacker Demico Jones. Sophomore linebacker Franko Gratton and senior safety Jermaine Smith are other starters that should mesh well with Patu. Patu has refined his pass rush with the help of his father, and he’s mastered it enough to get attention nationally as a premier recruit. Patu is ranked fifth in his class in the state of Washington by scouting website 247Sports.com. At Beach, Patu is wearing No. 84, which is his father’s college number flipped. In Orin’s season debut, a 38-13 Beach win against Fife, he had 12 tackles, two sacks, four hurries, three tackles for a loss, one fumble recovery, and one blocked field goal. Patu plans to sign to play with California in December and graduate early. He picked the school because of the uniqueness of the campus and Bears head coach Justin Wilcox played with his father at Oregon.